Russian Microelectronics covers physical, technological, and some VLSI and ULSI circuit-technical aspects of microelectronics and nanoelectronics; it informs the reader of new trends in submicron optical, x-ray, electron, and ion-beam lithography technology; dry processing techniques, etching, doping; and deposition and planarization technology. Significant space is devoted to problems arising in the application of proton, electron, and ion beams, plasma, etc. Consideration is given to new equipment, including cluster tools and control in situ and submicron CMOS, bipolar, and BICMOS technologies. The journal publishes papers addressing problems of molecular beam epitaxy and related processes; heterojunction devices and integrated circuits; the technology and devices of nanoelectronics; and the fabrication of nanometer scale devices, including new device structures, quantum-effect devices, and superconducting devices. The reader will find papers containing news of the diagnostics of surfaces and microelectronic structures, the modeling of technological processes and devices in micro- and nanoelectronics, including nanotransistors, and solid state qubits. 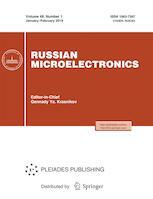 Russian Microelectronics is a peer reviewed journal. We use a double blind peer review format. Our team of reviewers includes 27 reviewers, both internal and external (37%), from 5 countries (Russia, Belarus, China, Belgium, Germany). The average period from submission to first decision in 2017 was 20 days, and that from first decision to acceptance was 60 days. The rejection rate for submitted manuscripts in 2017 was 15%. The final decision on the acceptance of an article for publication is made by the Editorial Board.